Samuel Morin from my year suggested that people draw themselves in their respective Hogwarts house after being sorted of course. It was then made into a banner for our year's facebook group. Everyone's turned out amazing! I enjoyed it thoroughly. I guess the discussion I had with my friend early first year really rings true, Sheridan Animation really is Hogwarts! 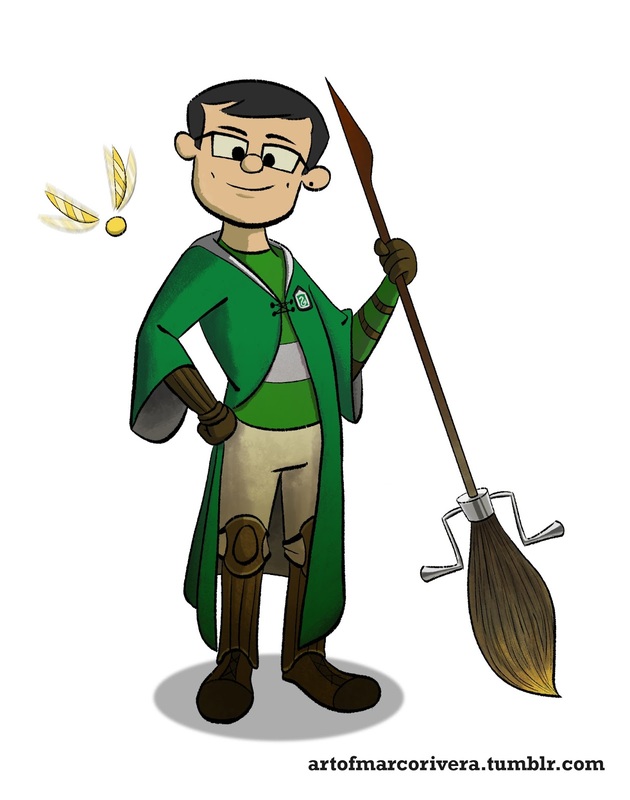 I was sorted into Slytherin several years ago on Pottermore so I drew myself as the seeker for the Slytherin quidditch team. Of course quidditch would be the only sport I would ever participate in voluntarily. I also couldn't imagine myself as a chaser or beater (considered keeper though) but according to Oliver Wood's description in Philosopher's Stone, I guess I fit the "build" of a seeker. Sam created a video with a compilation of everyone's drawings! Enjoy! And the banner Sam made with everyone's drawings! It looks amazing! Amazing job from everyone that participated!